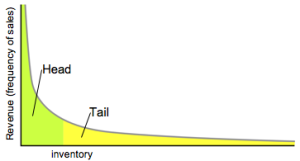 The “long tail” is often discussed as being a good thing, an aspect of the new economy that will companies to compete on giving customers a wider choice, rather than on price alone. It’s existence has been know to statisticians for a long time, and termed the long tail, the fat tail, the heavy tail, the power-law tail or Pareto tails. In a long tailed distribution there is a high frequency population, followed by a low frequency population following an asymptotic curve. In simple terms there are a few items often chosen and a great many items in frequently chosen. Years ago I was analysing sales data and noticed that my clients got more than 90% of their revenue from two products, one of which was about to go off patent. Their sales curve followed a extreme “long tail”, unfortunately a similar chart of their costs would not follow the same curve. This simple analysis was used by the company to re-examine the risk of the product going off patent. Now the “long tail” is associated with opportunity rather than risk, and in ground breaking work in Wired by Chris Anderson the analysis showed that one area where Amazon was having some unexpected success was just in the scale of their inventory. Whereas a physical bookstore can only house a few thousand books, so they will chose the books the books most likely to sell. The online business cuts out a lot of the physical costs of doing business and can have a theoretical unlimited inventory taking revenue off books that are really not popular. This books sit in the “long tail” of Amazon’s inventory. So as long as their distribution and storage costs for this inventory remain low they can make profit right across their inventory. As sales of the “unknown” product start to rise the former popular products in the head of the distribution come under threat. This is currently happening in the newspaper industry, whereas once a few publishers had control over almost all new publications the growing world of blogs and news websites mean that the news can now be delivered cheaply by a great many – and the audience attention is shifting to those sources which may be more customised to audience needs in terms of language, speed of release or point of view.